Between 1880 and 1920, the population of the Congo was slashed in half: some ten million people were victims of murder, starvation, exhaustion, exposure, disease and a plummeting birth rate. Why do you think this massive carnage has remained virtually unknown in the United States and Europe? 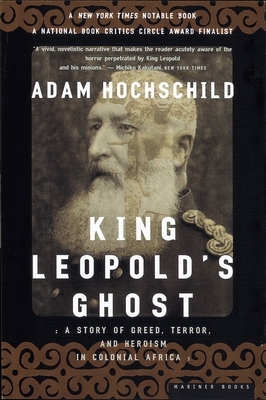 Hochschild writes of Joseph Conrad that he “was so horrified by the greed and brutality among white men he saw in the Congo that his view of human nature was permanently changed.” Judging from Hochschild’s account and from Heart of Darkness, in whatway was Conrad’s view changed? How is this true of other individuals about whom Hochschild writes? In what way has this book affected your view of human nature? The death toll in King Leopold’s Congo was on a scale comparable to the Holocaust and Stalin’s purges. Can Leopold II be viewed as a precursor to the masterminds behind the Nazi death camps and the Gulag? Did these three and other twentiethcentury mass killings arise from similar psychological, social, political, economic, and cultural sources? Those who plundered the Congo and other parts of Africa (and Asia) did so in the name of progress, civilization, and Christianity. Was this hypocritical and if so, how? What justifications for colonial imperialism and exploitation have been put forward over the past five centuries? Morel, Sheppard, Williams, Casement, and others boldly spoke out against the Congo atrocities, often at great danger to themselves. Many others rationalized those same atrocities or said nothing. How do you account for Leopold’s, Stanley’s, and others’ murderous rapaciousness, on the one hand, and Morel’s, Casement’s, and others’ outrage and committed activism, on the other? The European conquest and plunder of the Congo and the rest of Africa was brutal, but so was the European settlement of North America and, long before that, the conquest of most of Europe by the Romans. Hasn’t history always proceeded in this way? Hochschild begins his book with what he calls Edmund Morel’s “flash of moral recognition” on the Antwerp docks. What other flashes of moral recognition does Hochschild identify, and what were their consequences? In what ways may Hochschild’s book itself be seen as a flash of moral recognition? What more recent flashes of moral recognition and indignation can you identify? Hochschild quotes the Swedish missionary, C. N. Börrisson: “It is strange that people who claim to be civilized think they can treat their fellow man — even though he is of a different color — any which way.” How may we explain the disregard of “civilized” individuals and groups for the humanity and life of others because of skin color, nationality, religion, ethnic background, or other factors? Why do this disregard and resulting cruelties persist? What are the similarities between the colonial and imperial aspirations of pre- and early twentieth-century nations and the corporate and market aspirations of today’s multinational companies? Whether rapacious or beneficent, most actors in the Congo, and in Africa at large, seem to have been motivated principally by profit. In what ways do business objectives continue to shape the policies and actions of national governments and international organizations? The “burgeoning hierarchy of imperial rule” in the Congo Free State was, Hochschild writes, reflected in “the plethora of medals” and attendant grades and ranks. What were the reasons for this extensive hierarchy and for the bureaucracy it reflected and maintained? Are there any contemporary parallels? Of what historical examples can we say that the more heinous the political or governmental crimes, the larger and more frequently rewarded the bureaucracy? How does Hochschild answer his own question, “What made it possible for the functionaries in the Congo to so blithely watch the chicotte in action and . . . to deal out pain and death in other ways as well”? How would you answer this question, in regard to Leopold’s Congo and to other officially sanctioned atrocities? Hochschild quotes Roger Casement as insisting to Edmund Morel, “I do not agree with you that England and America are the two great humanitarian powers. . . . [They are] materialistic first and humanitarian only a century after.” What evidence supports or refutes Casement’s judgment? Would Casement be justified in making the same statement today? After stating that several other mass murders “went largely unnoticed,” Hochschild asks, “why, in England and the United States, was there such a storm of righteous protest about the Congo?” Do you find his explanation sufficient? Why do some atrocities (the mass murders in Rwanda, for example) prompt little response from the United States and other western nations, while others (the “ethnic cleansing” of Kosovo, for example) prompt military action against the perpetrators?